From the past, species have been transferred among ecosystems trough traveling and global trade. The establishment and spread of such invasive species has caused significant damage to the economy, the environment, and human or native species health. This review compiles information on infections or contact with pathogens reported in raccoons (Procyon lotor). Raccoons are opportunistic carnivores native to North America. However, nowadays they are distributed across mainland Europe as a result of escaped pets and introductions. In their native range, raccoons are known to be host to a number of disease agents that could be transmitted to humans, domestic animals and other wildlife. Hence, the increase of raccoon populations and their geographic spread in Europe may result in new disease hazards. 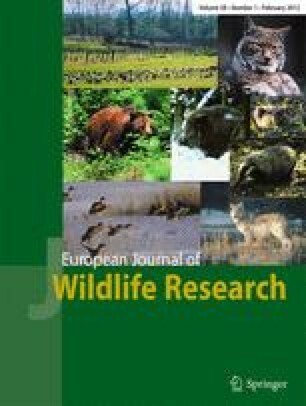 Raccoons have been identified as possible sentinels of diseases such as West Nile virus, and they pose a disease-related conservation risk by maintaining circulation of canine distemper virus. They also have the potential to participate in the maintenance of zoonoses including the raccoon roundworm Baylisascaris procyonis. Due its fast expansion and the large list of diseases, we conclude that the introduction of the raccoon has had adverse effects on health in Europe. This might well be the case of other invasive species, too. Hence, studies on invasive species health aspects are urgently needed to assess the risk of disease spread and eventually establish control measures. Francisco José García acknowledges support to research on raccoons from Madrid and Castilla—La Mancha regional governments and the Parque Regional del Sureste, Madrid. This is a contribution to MCINN Plan Nacional I+D+i research grant AGL2008-03875 and FEDER, and to FP7 EU grant TB-STEP (212414). We thank Pelayo Acevedo for Fig. 1.